We're very excited to announce that Reality Baby will make it's international premiere at Tribeca Film Festival in New York! Reality Baby will join film from around the world at the Tribeca Film Festival which brings visionaries and diverse audiences together to celebrate storytelling in all its forms, including film, TV, VR, gaming, music, and online work. With strong roots in independent film, Tribeca is a platform for creative expression and immersive entertainment. The Festival champions emerging and established voices; discovers award-winning filmmakers and creators; curates innovative experiences; and introduces new technology and ideas through premieres, exhibitions, talks, and live performances. The Festival was founded by Robert De Niro, Jane Rosenthal, and Craig Hatkoff in 2001 to spur the economic and cultural revitalization of lower Manhattan following the attacks on the World Trade Center. Now in its 18th year, the Festival has evolved into a destination for creativity that reimagines the cinematic experience and explores how art can unite communities. The 18th annual edition will take place April 24 - May 5, 2019. We're very excited to announce that Reality Baby will screen at Dublin International Film Festival as part of the Screen Ireland showcase on Saturday 23rd February at 6pm. We're delighted to be premiering our documentary short Reality Baby at Cork Film Festival 2018. The film is part of the Screen Ireland Showcase on Saturday 17th November. Broadcast magazine have selected My Trans Life as one of their Hot Picks at Mipcom 2018. The online trade publication feature their choice of the best of the market in the current edition - read the article. We're delighted to announce that My Trans Life has been nominated, alongside Channel 4's Genderquake and Vice Media's My House, for the LGBTQ+ TV non-scripted category at the 2018 Difersify TV Excellence Awards. Dedicated to championing and promoting diversity and inclusion in all forms across the international television industry, the second edition of the MIPCOM Diversify TV Excellence Awards will take place on Tuesday 16 October 2018 in the Grand Salon of the Intercontinental Carlton Hotel, Cannes, France, during the global entertainment content market, MIPCOM. We are very proud to announce that our series My Trans Life - co-produced with That's a Wrap TV - has been nominated for the prestigious Prix Europa in the TV Documentary category! The competition, which selects the best media productions from around Europe, runs from the 13th - 19th October 2018 in Berlin. Watch the My Trans Life trailer here. Galway City of Film concludes its 100 Years of Irish Cinema programme with a look at Contemporary Irish Documentary as Social Commentary. Paula Kehoe, Galway-based Australian filmmaker, has chosen three seminal Irish documentaries that will screen at An Taibhdhearc, Galway city from 12pm on Saturday afternoon, December 3rd. The 3 films - Living in a Coded Land, The Road to God Knows Where and Broken Song - will be presented by directors Pat Collins, Alan Gilsenan and Claire Dix. We've had a long and fruitful working relationship with the very talented UCD Choral Scholars, so we were delighted to be asked to create two music promos for the for the release of their album Invisible Stars. This beautiful, spine-tingling, version of the traditional Irish song Mo Ghille Mear has been finding a big audience in Europe and the US. Mo Ghille Mear is a lament, arranged here by Desmond Earley and sung beautifully by soloist Mark Waters. The promo was created by Zucca Films and shot on Henrietta St by Richard Kendrick with costume design by Alex Calder. Emmet Reddy edited and the grader was Leandro Arouca at Media Milk. James Costello travelled to Switzerland to present Broken Song and give a live performance at the 6th Norient Music Film Festival. Watch him rapping with Senegalese artist Xuman on Bern local radio. Next up for Costello is a trip to Moscow during St.Patrick's week where he will present a screening of Broken Song and perform two live shows as part of Moscow Irish Week. Our new short documentary Seventh Son will make it's debut at the Stranger than Fiction documentary festival in the Irish Film Institute this weekend. Directed by Narayan Van Maele and filmed by Narayan Van Maele and Kate McCullough, the film explores the Irish tradition of the cure through the eyes of Brian Lavin, a seventh son from Swinford, Co. Mayo. Seventh Son was funded by the Irish Film Board under the Reality Bites scheme and was produced by Nodlag Houlihan. Broken Song made a very successful debut in Croatia, playing to a packed audience at the beautiful outdoor theatre in Paklenica National Park. The screening was presented by producer Nodlag Houlihan. It was quite an experience to hear Willa Lee's voice echoing around the mountains and to see his music transcend the boundaries of language and culture. Thanks to everyone at the festival for making it happen. We're delighted to announce that Broken Song has been nominated for the George Morrison Feature Documentary Prize at this year's IFTA Awards! We're very happy to be nominated and are looking forward to the ceremony which will be held on the 5th of April in Dublin. Broken Song will screen as part of a double-bill of Reelart documentaries at the Curzon, Soho. The programme starts at 2.45 on February 1st and will be followed by a Q&A with the filmmakers and cast member, James Costello. Tickets available from the Curzon box-office. The following week the film will play at the Triskel Arts Centre, Cork from the 7th - 10th of Feb. Tickets are now on sale at the Triskel box-office. The Sunday night show at 6pm will be presented by the filmmakers and followed by a Q&A and performance from the cast. Broken Song will also screen in Dublin on the 4th of February at the Twisted Pepper, as part of an event run by Head Strong, promoting mental health awareness. Tickets available from Head Strong. The director and cast will participate in an after show discussion. Downpour took home a Special Jury Prize at the Island Film Festival in Polynesia over the weekend. Downpour was awarded the Special Jury Prize at the first edition of the Courts des îles Festival in Tahiti on Sunday. Only films made by directors who were born on an island were eligible for the competition. 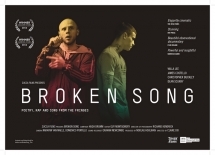 We're delighted to announce that Broken Song will play at the IFI from 15th - 21st November. Broken Song premiered on Friday the 15th of November in the IFI to a full house in Cinema 1. After the screening there was a lively Q & A session chaired by Suniva O' Flynn with Director Claire Dix and castmembers Dean Scurry, James Costello and Willa Lee. Following this the audience were treated to an acapella performace of Illosopical and Let it Blaze by Costello and Lee respectively. Broken Song will run until Thursday the 21st of November in the IFI and tickets are now on sale from the IFI Box Office. Buy tickets for Broken Song here. Documentary 7th Daughter of a 7th Daughter awarded Reality Bites funding from Irish Film Board. Zucca Films are delighted to announce that we have received the Reality Bites Funding from the Irish Film Board to produce the short documentary 7th Daughter of a 7th Daughter. The 7th daughter of a 7th daughter is attributed with special healing power; they have “the cure". The power to heal all living things. Traditionally, the gift is passed to one member of the family in each generation. This observational film focuses on Agnes Padden, herself a 7th daughter of a 7th daughter, and the dying tradition of ‘the cure’. Directed by Narayan Van Maele and produced by Nodlag Houlihan, the film will witness Agnes giving the cure to people who have come from miles around seeking her healing touch. We are delighted to announce our short film Alia was awarded Best Irish Narrative Short at the closing ceremony of the 14th edition of the Kerry Film Festival on Saturday, 12th October. 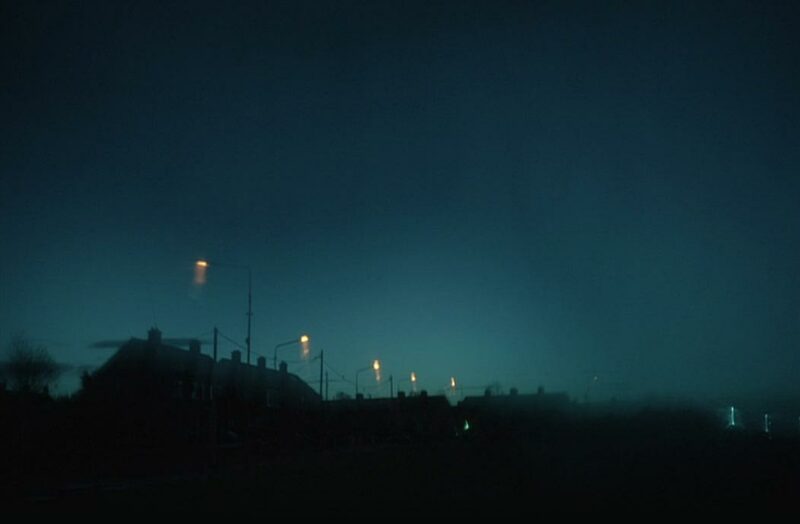 Alia, which relates the story of an Afghan family living in inner city Dublin, was directed by Claire Dix, shot by Piers McGrail and produced by Nodlag Houlihan. Alia was funded by the Irish Film Board under the Signatures scheme. Lenny Abrahamson was the adjudicator for the prize. 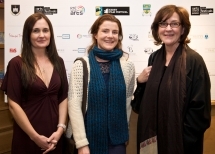 Pictured right are Roisin McGuigan (Festival Director) with prizewinners, Nodlag Houlihan (Producer, Alia) and Consolata Boyle (Recipient of the Maureen O'Hara Award). Downpour busy on the International Film Festival circuit this Winter. We are delighted to announce that short film Downpour, written and directed by Claire Dix has been invited to screen at festivals in the Ukraine, Tahiti and the USA during the winter months. Downpour has been invited to represent Ireland at the International Festival of Short Fiction Films from the Islands of the World, Courts des îles, in French Polynesia and will also screen at the Capital Irish Film Festival in Washington. Check our screenings page for more details. We are delighted to announce that Alia will be screening at this year's Oulu Film Festival, Oulu, Finland. Alia is directed by Claire Dix, Produced by Nodlag Houlihan and stars Barya Shafaq, Jumaan Short and Nayef Rashed. The festival will take place between 18th and 24th November 2013. The Oulu International Children’s and Youth Film festival has established itself as a premier showcase for the high-profile Nordic and international children’s and youth cinema. It was founded in 1982 as the first of its kind in Northern Europe. We are delighted to announce that Alia will be screening at this year's Kerry Film Festival. Alia is directed by Claire Dix and stars Barya Shafaq, Jumaan Short and Nayef Rashed. The screening will take place at 11am on the 9th of October. Hope to see you in Kerry! We're delighted to announce that our short Alia, directed by Claire Dix and starring Barya Shafaq, Jumaan Short and Nayef Rashed, won an award at Capalbio Film Festival in Tuscany over the weekend. Alia, which relates the story of an Afghan-Irish family living in Dublin, was awarded the 'Dialogue between the Civilisations' prize last Friday at the festival. Alia busy on the European Film Festival circuit this Summer. Our short film Alia, written and directed by Claire Dix and featuring Barya Shafaq and Jumaan Short, has been invited to screen at festivals in Croatia, Portugal, Italy and France over the summer months as well as at the Galway Film Fleadh in Ireland. Check our screenings page for more details. Broken Song Screening at Guth Gafa. Broken Song had a successful screening at the Guth Gafa Documentary Festival in Donegal on the 18th May. Director Claire Dix presented the film and participated in a Q&A with the audience after the screening. Broken Song winner of two awards at JDIFF 2013! Double win for Broken Song at JDIFF. Broken Song had a very sucessful premiere screening at JDIFF! We're delighted to announce that the film proved popular with audience and critics alike taking home the Audience Award and the Dublin Critics Circle Michael Dwyer 'Discovery' Award (for director Claire Dix) at the Jameson Dublin International Film Festival 2013.